What Do I Hear Now, Groupwise? Groupwise (1983) is a chamber work from Babbitt’s third stylistic period consisting of flute (doubling alto flute and piccolo), violin, viola, violoncello, and piano. The structural foundation of compositions from this period is known in the literature as a superarray, a composite of multiple simultaneously unfolding all-partition arrays (Mead 1994). In a paper presented at the 1989 SMT national conference, I argued superarray compositions appear to be fundamentally different from the compositions of the preceding periods (Scotto 1989). They appear to embody a change in the aggregate compositional process where the perception of aggregate boundaries is essential to aurally differentiating one aggregate, the basic linear and columnar unit of aggregate composition, from another. The pitch duplications generated by a superarray obscure the perception of chromatic completion, which is one method of aurally differentiating aggregates. Perceiving aggregate boundaries in a superarray composition is analogous to perceiving state lines on a cross-country drive of the United States. The map directing the trip indicates crisp divisions between all states. The experience of those divisions while driving can be crisp, imperceptible, or anything in between. Sometimes, especially in the Plains States, the map may be the only indication that a state line has been crossed. Other times, the change is crisp and immediately detectable, such as crossing the Columbia River from Portland, Oregon, to Vancouver, Washington. In a later article, I argued superarray compositions might also signal a change from a generative model of motivic structure to a holistic model where the development of motivic material is a non-hierarchical and non-teleological process (Scotto 2002). In this model, motives are analogous to plateaus that form from areas of coagulation and rise above a plane, and then they collapse and are absorbed back into the plane. Their common planar origin makes all plateaus motivic. Although the plateaus emanate from the same source, they can be structurally non-equivalent as well as similar or even equivalent. Associations among plateaus create a constantly developing non-hierarchical and non-teleological motivic surface. The contrapuntal arrangement of component arrays in the superarray of Groupwise facilitates making associations among plateaus. Moreover, while the pitch duplications of the superarray may obscure crisply perceiving aggregate boundaries, they may actually facilitate making structural associations among plateaus, which will also facilitate hearing the effect of aggregate changes (rather than their boundaries) as the piece progresses. The all-partition array functioning as the building block of the superarray for Groupwise consists of six simultaneously unfolding twelve-tone rows and fifty-eight partitions. To fill out all fifty-eight partitions, the array uses all forty-eight members of the row class, and the beginning and end of a group of six rows divides the fifty-eight partitions into eight subgroups or blocks. The D-hexachord 6-32[0,1,2,6,7,8], which generates three hexachordal areas, serves as the foundation of the twelve-tone row for Groupwise. Row pairs within each array block are hexachordally combinatorial, and since each row pair represents one of the D-hexachord’s three hexachordal areas, each block contains rows from all three hexachordal areas (Mead 1994). Example 1. Hexachordal area assigned to the pitch ranges of the string instruments. Example 2. Transformational relationships among all-partition arrays B, C, D, and E.
Example 3. Mapping of hexachordal area in array pairs B/E and D/C. Example 4. The fifteen non-null subsets of four objects using all-partition arrays B, C, D, and E as objects. Example 5. Ordering of the fifteen subsets produced by the four all-partition arrays and the form that results from the ordering. The last section of each division contains a single block from one of the four all-partition arrays, and a trio of blocks always precedes the “solo” block. Subgroups one, two, and three each have two duets preceding the trio. The placement of the single subset containing four parts is especially suggestive. The example illustrates that the quartet of array blocks substitutes for the two duets of the first three subgroups. Essentially, the quartet is two stacked duets. The beginning of the fourth subgroup is a culminating point from a pitch density perspective since all the arrays are contributing pitch-class material. Although the first three subgroups contain constantly changing instrumental combinations and registral shifts within instruments, the overall pattern of pitch-class density is constant. The climactic point in the piece breaks two patterns. First, pitch-class density reaches a level exceeding all previous levels. Second, the constantly changing instrumental combinations and registral shifts stop since all the accompanying instruments in all their pitch ranges are playing. Example 6. Invertible contrapuntal array blocks. Example 7. Quasi-symmetrical structure of the pairs of invertible countrapuntal array- blocks. Example 8. Paired invertible countrapuntal array-blocks containing large row-segments. Even more interesting than the ordering of the fifteen array subsets is the contrapuntal arrangement of the array blocks and array partitions it produces. Within each subset of array blocks, the partitions align in a partition contra partition fashion. 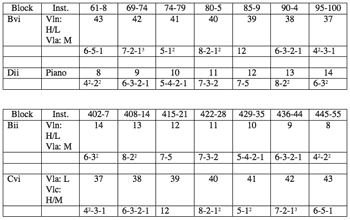 For example, partition 58 from block Bviii, 3-24-1, aligns with partition 1 from block Di, 4-3-2-13, in measures 1–2. 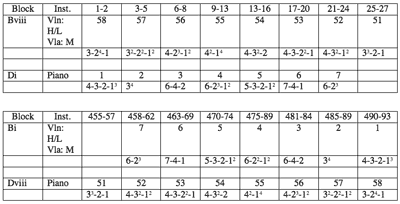 The alignment of partitions generated from blocks Bviii/Di in the first section of the work occurs again as a subset of the trio in measures 458–493. However, this time Bi aligns with Dviii. The partitions and their alignment remains the same, but the partitions switch from one array block to another (see Example 6). Moreover, the partitions in the paired array blocks are retrograde related. For example, the partitions (and the row segments contained in the partitions) in block Di are the retrograde of the partitions in block Bi. If the paired blocks are members of the same array, the row segments within partitions will all be related to each other by the transformation relating the arrays. Furthermore, the instrumental combinations and ranges of the pitch-class material will remain the same. Essentially, Babbitt has created a type of invertible array counterpoint. Even more remarkable is the quasi-symmetrical relationship the pairs of invertible countrapuntal array-blocks create in the overall form of the work (see Example 7). Partitions in the paired invertible array-blocks containing large row segments create environments especially rich with plateaus for motivic association. For example, the landscape created by invertible countrapuntal array-blocks Bvi/Dii and Cvi/Bii contains particularly fertile soil (see Example 8). Since the arrays are transformations of each other, the row segments in all the partitions will always be order number identical. For example, the eight note segment in partition 40 of block Bvi is the segment of T7I(P) contained in order numbers four through eleven, and the eight note segment in partition 40 of block Cvi is the segment of RT0I(P) also contained in order numbers four through eleven. Moreover, the transformation relating one array to another will also relate every order-number-identical row segment. For example, since T5 relates arrays B and C, it also relates the eight pitch-class order-number-identical row segments in partition 40 and the order-number-identical six-note segments in partition 38 of array blocks Bvi and Cvi. The same transformations relate the contrapuntal counterparts to partition 40 in each array pair (partition 11). Of course, the pitch realization of the partitions can either enhance or obscure connecting motivic material (compare Examples 9 and 10). Example 9. Pitch-realization of partitions 40 and 11 from array blocks Bvi and Dii, respectively (for clarity, the example excludes pitch-class material from other array blocks in the violin part). Example 10. 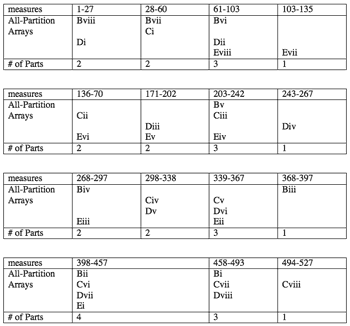 Pitch-realization of partitions 40 and 11 from array blocks Cvi and Bii, respectively (for clarity, the example excludes pitch-class material from other array blocks in the violin part). While the phrase “multiple simultaneously unfolding arrays” is a verbose but accurate and neutral way of describing the serial structure of compositions from Babbitt’s third stylistic period, “superarray” has become the accepted and abbreviated alternative descriptor. However, the term can be problematic. The superarray view of multiple simultaneously unfolding arrays does not adequately capture their potential for altering the compositional process because, in some ways, the term implies more of the same only bigger. At least for Groupwise, the term “contrapuntal array composition” more adequately captures the process associated with the simultaneously unfolding arrays. In this small tribute to the monumental contribution Babbitt’s music has made to the craft of composition, I have tried to demonstrate that Groupwise may use a familiar structure but not in a familiar way. For example, contrapuntal arrays introduce an element of repetition that is not characteristic of Babbitt’s earlier works. Moreover, while the repeated pitch classes produced by contrapuntal arrays make hearing aggregate boundaries more difficult, the repeated and paired partition segments facilitate making motivic associations that create a coherent but constantly developing non-hierarchic and non-teleological motivic surface. Scotto, Ciro. 1989. “What Do You Hear, Groupwise?” Presented at The Society for Music Theory National Conference, Austin, Texas. Scotto, Ciro. 2002. 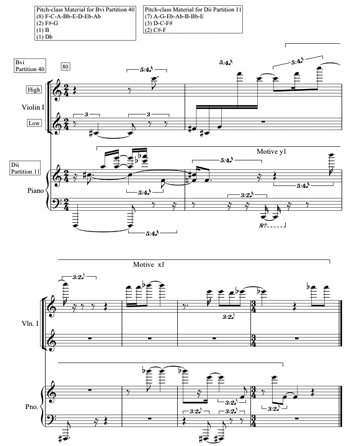 “The Conflict Between Particularism and Generalism in Andrew Mead’s Introduction to the Music of Milton Babbitt.” Journal of Music Theory 46: 285–345. —————. 2002. 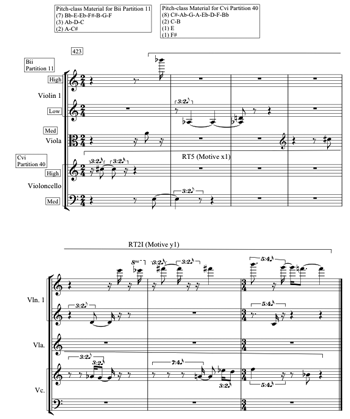 “The Conflict Between Particularism and Generalism in Andrew Mead’s Introduction to the Music of Milton Babbitt.” Journal of Music Theory 46: 285–345. 1. Besides its more lyrical and densely packed lines, the flute is the only instrument in the ensemble that doubles another instrument. Moreover, when the flute switches to the alto flute or piccolo, trichordal arrays rather than all-partition arrays generate its pitch material. Both of these structural features of Groupwise suggest that the flute essentially functions as a solo instrument. 2. A more complete study of the effect of the TnM operation on the pitch material in the flute is, of course, beyond the scope of this small study. 3. The operation T7I is one of four inversion operations (T1I, T4I, T7I, and TtI) that maps hexachordal area III of the row for Groupwise onto itself with C=0. Although each operation will not change the pitch-class content of hexachordal area III, they will change the order of the pitch classes within the hexachordal area. However, the ordering induced by T7I does not appear to be a significant factor in its choice. Therefore, any operation from this set will produce equivalent results. 4. The operation T5 maps the hexachordal areas in the following pattern: I→II, II→III, and III→I. 5. Mead presents a different chart of the superarray structure in An Introduction to the Music of Milton Babbitt: 234. Besides its more lyrical and densely packed lines, the flute is the only instrument in the ensemble that doubles another instrument. Moreover, when the flute switches to the alto flute or piccolo, trichordal arrays rather than all-partition arrays generate its pitch material. Both of these structural features of Groupwise suggest that the flute essentially functions as a solo instrument. A more complete study of the effect of the TnM operation on the pitch material in the flute is, of course, beyond the scope of this small study. 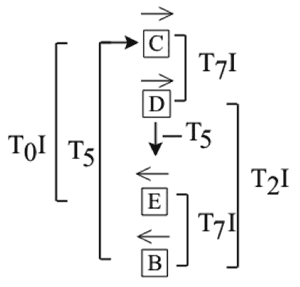 The operation T7I is one of four inversion operations (T1I, T4I, T7I, and TtI) that maps hexachordal area III of the row for Groupwise onto itself with C=0. Although each operation will not change the pitch-class content of hexachordal area III, they will change the order of the pitch classes within the hexachordal area. However, the ordering induced by T7I does not appear to be a significant factor in its choice. Therefore, any operation from this set will produce equivalent results. The operation T5 maps the hexachordal areas in the following pattern: I→II, II→III, and III→I. Mead presents a different chart of the superarray structure in An Introduction to the Music of Milton Babbitt: 234.